If you want to raise a family in a quiet, safe neighborhood, away from the city, then Surprise is an excellent choice for living. It is just about 45 minutes away from downtown Phoenix, and is home to many of those who work right within Phoenix. It is surrounded by beautiful desert scenery and mountain park lands, and thus often holds many community events, such as festivals, barbeques, and more. It is a fantastic place for neighborhood family communities, providing many parks and recreational activities. Consisting of roughly 121,000 residents, it is a smaller town that is made up mostly of neighborhoods, parks, and smaller businesses. Your roof in Surprise can be repaired or replaced by top rated professionals, trust the experts at Arizona Roof Rescue. Licensed, bonded, and insured, we have been serving Surprise and surrounding cities with over twenty years of roofing experience. Experience Roofing Contractors in Surprise are easy to find thanks to Arizona Roof Rescue. We provide new shingle roof installations for any home or business in Surprise. Top Rated professionals, Arizona Roof Rescue does the job better than the rest.. Even though Surprise is a younger city, roof repair cannot be ignored due to the fact that the materials for a home are cost efficient and may not be prepared for hard weather. Arizona Roof Rescue provide excellent quality roof repairs for your home or business. With that known, Surprise is a younger city and is often overlooked by most roofing companies. This is because roof tops ranging from 10-15 years old are thought to last longer throughout the seasons of the Sonoran Desert. This couldn’t be further from the truth. Because so many houses are to be built at such a quick pace, the materials for the homes are cost efficient and are not prepared for any sudden raining or dust storms. This causes unpredictable leaking and tearing of rooftops, and along with that, unexpected visitors, such as wolf spiders and scorpions, enter the houses from torn open holes. There is also an issue with the heat, as unpredictable roof damage also causes poor insulation. 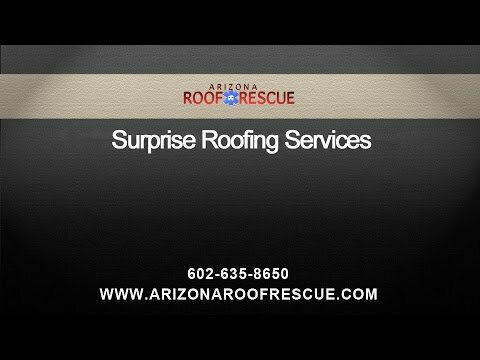 Arizona Roof Rescue can provide affordable and reliable rooftop repairs to Surprise, as we recognize your needs. Value and quality are our primary concerns, as we are familiar with dealing with insurance companies. We can expedite claims, as we are licensed, bonded, insured, and our Surprise roofing contractors are NATE certified. Our workmanship is guaranteed. There is no reason why younger neighborhood communities and commercial rooftops should be ignored. We are here to provide the most dependable and affordable care at any time. Customers shouldn’t have to schedule repair numerous times for the same problem when the roof can be replaced altogether. Yet, the pricing for roof repair can be tricky, as we try to incorporate the best work, which requires more effort and better material. We still insure that we want our service to be affordable for our clients. We service the Surprise area including several towns such as Sun City Grand, 85335, 85361, 85378, 85387, 85396, 85355, 85374, 85379, 85388, as well as most parts of Arizona. For any information regarding the pricing of rooftop repair and replacement, call us at Arizona Roof Rescue to get a free estimate on your roof replacement, and be surprised at how affordable we can be! Headquartered On The Surprise Glendale Boarder!